The new semester at Astronaut Academy may have just started, but there’s already 24 pages of adventure waiting for you in the ARCHIVE. Find out what happened during winter break! Greetings and hello! Dave Roman, reporting in and ready for serialization! After two years of writing and drawing in the isolation of deep space (my apartment), I’m super excited to share the newest adventures from Astronaut Academy with the outside world (the internet). 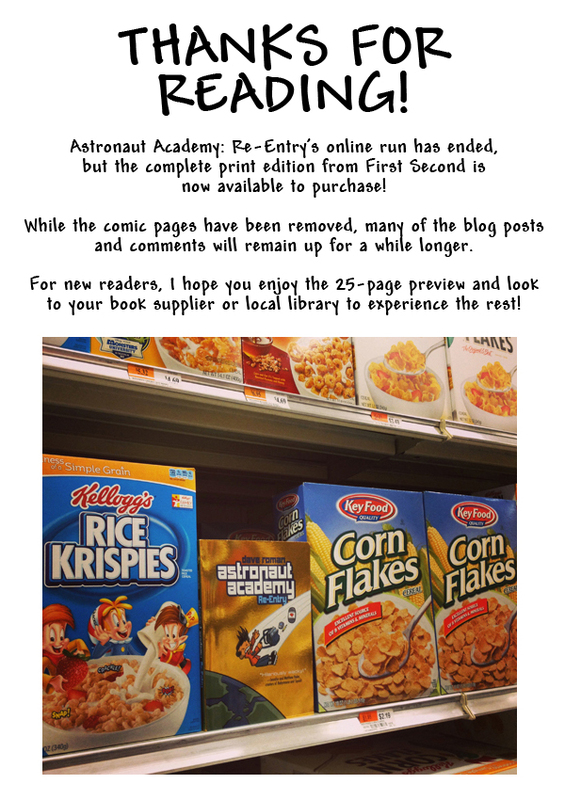 Since Astronaut Academy had its origins as a webcomic, I’m delighted that First Second has given me the opportunity to serialize the newest graphic novel, Astronaut Academy: Re-Entry, online! The new story is all about heart—multiple hearts, in fact—and a mysterious something that is trying to steal kids’ hearts away. On many of the pages, I’ll be sharing some of the personal anecdotes and heartbreaks that lead to scenes in the comic, and reflecting on all the cultural references and inspirations. 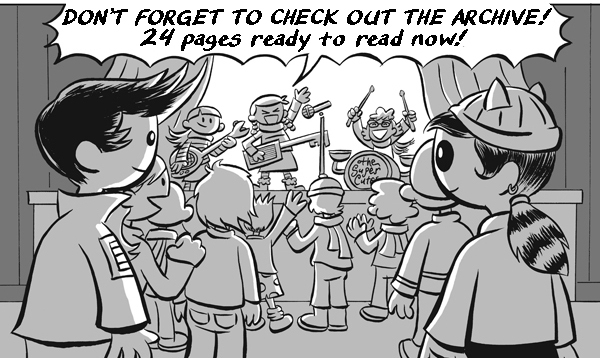 At its core, Astronaut Academy is a blended smoothie of pop-culture love! Science fiction, comedy, video games, anime, and newspaper comic strips have all gone into the blender. Some ingredients like Astroboy, Voltron, and Harry Potter might be obvious, while others, like Battle Beasts and the Ed Grimley cartoon show, are more on the obscure side. On Mondays and Fridays I’ll be posting in-depth blog posts, including a series of “Love Letters” to favorite things that helped inspire Astronaut Academy. And to make it even more fun, I’m asking some of my comics-making friends to contribute their own pop culture love letters! If anything jumps out at you that you think would make a great blog post, just drop me a line. The more contributors the better! Before I wrap up this first post, I wanted to thank Lissa Pattillo for doing an awesome job designing and maintaining this website! Additional thanks to the supportive folks at First Second Books: Calista Brill, Gina Gagliano, Colleen Venable and Mark Siegel. I’m continually thrilled that Astronaut Academy is part of such an amazing collection of graphic novels and online comics! Thanks in advance for any and all comments, links, and spreading of the word. Your support means the world to me. I’ll be back with another blog post on Friday. See you in the future! I’m really just kidding! I really like this book and I cant wait until my library gets this book so I can read it!! !